Lead Editors - Your name will be added here if you are a lead editor on this page. Pain and symptoms localized in or around elbow. May present with neurological symptoms local or distant to elbow. • Timeline-When are the patients reported symptoms at their worst? • Mechanism of the injury- In the case of a traumatic event, the mechanism of injury helps guide the diagnosis. For atraumatic injuries, specific symptoms can be highly useful in determining a diagnosis. For example: patient reported numbness and/or tingling in the 5th digit may suggest ulnar neuropathy. • Presence of numbness or tingling? 1. Do your symptoms change (better or worse) with any movements of the neck or shoulder? 2. Does your elbow ever “slip out” or feel unstable? 3. Does the pain change with gripping activities? 4. Do you ever experience numbness of tingling in the hand? 5. Was the elbow hyper extended during the time of injury? 6. Do you relate the symptoms to a throwing activity? During the initial examination, environmental and personal factors should be addressed. 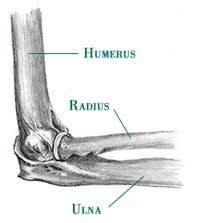 These issues could affect healing and return of function after an elbow injury. Table 1 outlines these issues. PREE and ASES: Patient-rated elbow evaluation (PREE) and American Shoulder and Elbow Society evaluation(ASES) are two similar scales that allow the patient to self-report their pain and disability related to their elbow pathology. The conceptual difference between the two scales is minimal and the correlation between the two scales usually exceeds 0.90. P4: P4 is a 4-item pain intensity measure. The P4 asks patients to rate pain in the morning, afternoon, evening, and with activity over the past 2 days. The P4 can be particularly useful as the elbow is greatly impacted by movement and time of day. SF-36: SF-36 is a generic health form. It is appropriate to address broad areas of health. For individuals with elbow dysfunction, the SF-36 is not a good tool to evaluate change in the clinic for patients with elbow disorders because it is not responsive and specific to the symptoms that the patient is reporting with. This measure can also be very time consuming and difficult to use. • Red and Yellow Flags- Conditions that may require referral to appropriate health care provider. - The information from the history should be correlated with imaging findings of the elbow when available. General posture of the upper quarter: Proximal factors should be considered which could predispose the patient to elbow symptoms. Carrying angle: The carrying angle has a mean value of 10 degrees for men and 13 degrees for women. The goal in performing functional test is to obtain and quantify an asterisk sign to assess and reassess after intervention is performed. Push-off Test: The push off test can be used to quantify a person’s ability to bear weight through the upper extremity. This can help identify functional/occupational limitations. (ICC=0.31-0.97). - Positive Elbow Extension Test may indicate fracture and referral. Posterior-anterior glide assessment on cervical/thoracic spine for distal symptoms reproduction as well. ↑ 1.0 1.1 1.2 1.3 1.4 1.5 1.6 1.7 1.8 1.9 MacDermid JC, Michlovitz SL. Examination of the elbow: linking diagnosis, prognosis, and outcomes as a framework for maximizing therapy interventions. J Hand Ther. 2006; 19(2):82-97. ↑ Flynn TW, Cleland JA, Whitman JM. User’s Guide to the Musculoskeletal Examination: Fundamentals for the Evidence Based Clinician. Evidence in Motion, 2008. ↑ King GJ, Richards RR, Zuckerman JD, et al. A standardized method for assessment of elbow function. Research Commitee, American Shoulder and Elbow Surgeons. J Shoulder Elbow Surg. 1999; 8:351–4. ↑ 4.0 4.1 4.2 4.3 Colman WW, Strauch RJ. Physical examination of the elbow. Orthop Clin North Am. 1999; 30(1):15-20.